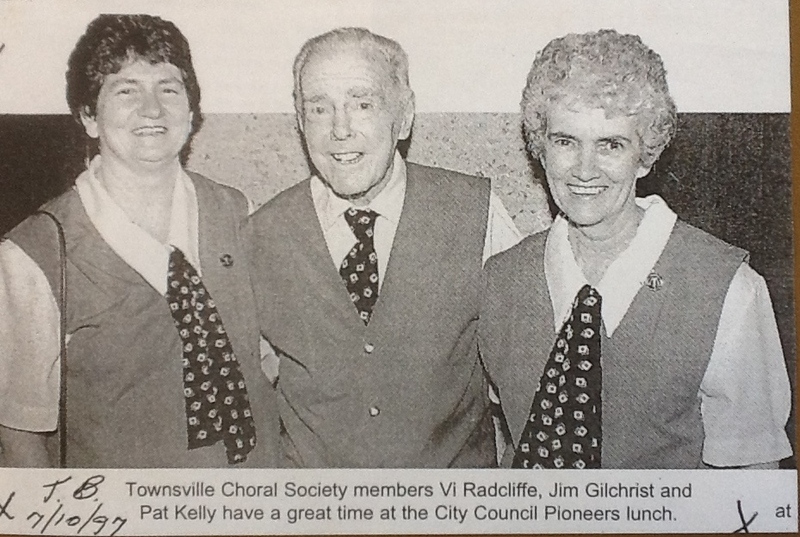 Jim Gilchrist with fellow Townsville Choral Society members Vi Radcliffe (L), and Pat Kelly. Jim was born in Fraserburgh in Scotland and came to Australia in 1911 with his parents and his brother Wilson. They initially settled in Home Hill as they were related to the Trail family who lived there. In his younger days he was an all-round sportsman, playing tennis, rugby league, soccer, and cricket. Jim joined the Townsville Choral Society in 1925 as an 18-year-old tenor and when the Choral Society went into recess during the war a few entertainers formed a glee party called the Gadabouts. They used to sing at the military camp and hospitals in North Queensland to entertain the troops and the sick. He was part of the backing choir for Messiah which was presented by the Queensland Symphony Orchestra in Townsville in July 1997. 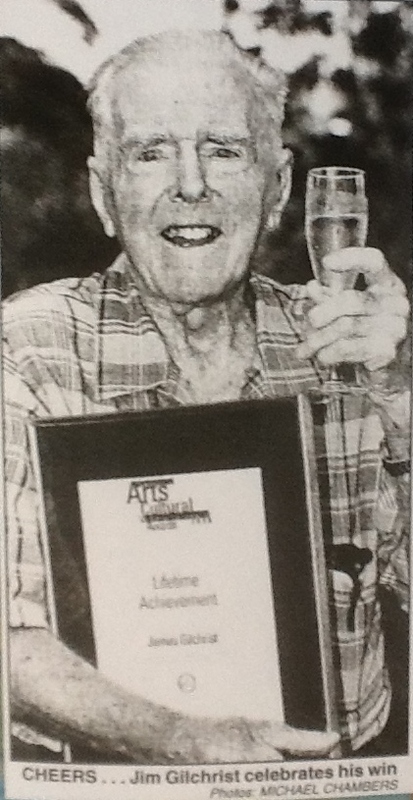 In 1998 Jim received a Lifetime Achievement Award at the Townsville Arts, Cultural & Entertainment Awards at the Civic Theatre. By 1998 he had been active in the Townsville Choral and Orchestral Society for 75 years, and was also the North Queensland Eisteddfod’s keenest competitor, having contested 65 of the 72 held by that year. On the 9th April 1997 Townsville’s “Sun” newspaper ran an article on Jim and at the time, at aged 90, he was spending his Saturday mornings using the whipper snipper over the lawns of the Masonic Home in Kirwan. At the time he had also been a volunteer for Meals on Wheels for 24 years since retiring from work. He was honoured with the ABC Radio Queensland Rail Unsung Hero of the Week award.